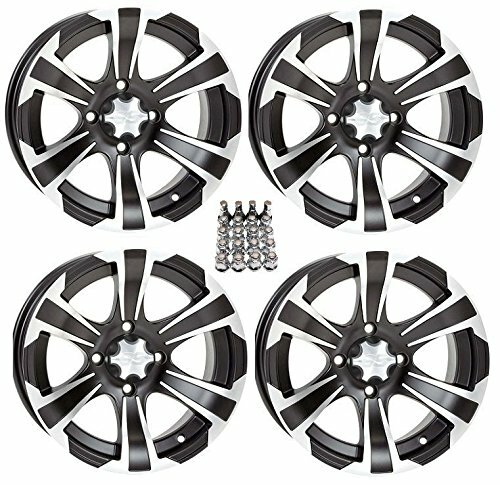 Bundle Includes:(4) ITP SS312 Black ATV Wheels Front/Rear 12x7 4/110 - (5+2) [12SS700] + (1) RuggedPRO Chrome Lug Kit & Valve Stems - 10mm x 1.25" [Beveled]. These wheels will fit various indendent rear suspension machines (IRS): Honda IRS (Rincon, Rancher, 2015-2018 Rubicon), Kawasaki IRS (Brute Force), Suzuki IRS (King Quad) & Yamaha IRS (Grizzly, Rhino, 2016-2018 Kodiak). Tire clearance varies by specific machine. Most machines can go at least 1" larger on the tire diameter. This kit will NOT work on Honda Pioneer, Yamaha Viking or Yamaha Wolverine SXS's. NOTES: If you any questions or concerns about fitment please contact us by email or phone BEFORE you order. All of the wheels we sell include center caps (except MSA F1 and F2 Forged wheels which include name plates). When you buy a set of 4 wheels OR 4 wheels & tires from us we include a Chrome Lug Kit at no additional charge ($20 Savings). Beware of other companies that do not include lug nuts & valve stems with their wheel sale, some wheels require a special type of lug nut to fit into the wheel and your stock lug nuts may not work. If you wish to substitute the Chrome Lug Kit with a Black Lug Kit you must contact us prior to ordering to verify availability and to ensure the change is made before the product has been packaged/shipped. We stock the majority of what we sell to ensure you get a great price and your order is shipped in a timely fashion. We ship all orders within 1 business day. If you are interested in a mounted setup and don't see what you are looking for on our store please let us know. We can always package any tire we offer on any wheel we offer and they will come to your door mounted and ready to bolt on to your machine.